The publishers have made every effort to assure the accuracy of information contained on the web site, but under no circumstances makes any warranties or representations of any kind concerning the accuracy and suitability of the information contained on this web site for any purpose. The material on this web site is subject to change. Use of this site, these materials and links provided to other web sites shall be at the user’s own risk and under the condition that the publishers are not liable for that use or its results. Forewarning of potential damages or risks shall not create liability for the publishers of any sort. The EDC Initiative cannot be held liable for any (in)direct damage as a result of viruses on its website.The EDC Initiative reserve the right to change the information on this website without prior notification. 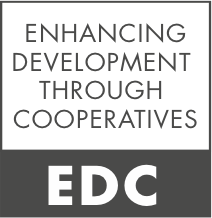 Links to other web sites are provided by the EDC Initiative in good faith and for information only.The EDC Initiative disclaim any responsibility for the materials contained in any web site linked to this site.